You are here: Home / Politicking / Campaigning / Clinton Cash – now a graphic Novel! 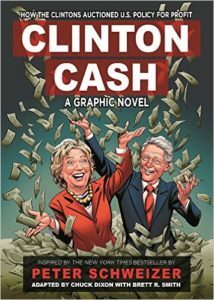 Clinton Cash – now a graphic Novel! A brilliant new way to explain Clinton corruption to Millenials has hit the presses. The story of Pay to Play in full color with lots of pictures makes it easy for any Clinton supporter to understand the depths of their depravity. Rich, full-color panels guide the reader through the questionable activities that enriched this Democratic power couple. This graphic novel covers it all – from “Free” Haitian Phones to coincidental U.S. policy changes that benefitted the countries and organizations paying for speaking gigs.